Maggie, an up-and-coming literary agent, succumbs to her room-mate’s urging to attend the opening night release for a new tech device. But it doesn’t hold much appeal for her as she’s seen the ill-effects such devices have on people and she’s not impressed. But after further prompting she decides to give it a try anyway. Once she experiences a trial of the Vertix she’s immediately hooked by the intoxicating experience. And it doesn’t take long for her addiction to turn on her. Soon the device is taking over, and she is unable, or unwilling to disconnect from the Vertix high. Author Caytlyn Brooke’s Wired is a chilling sci-fi adventure so breathlessly intoxicating readers will fall along with Maggie as her growing need for greater high-tech highs consumes her every thought. Brooke’s ability to paint astonishing worlds via the written word is truly inspired. 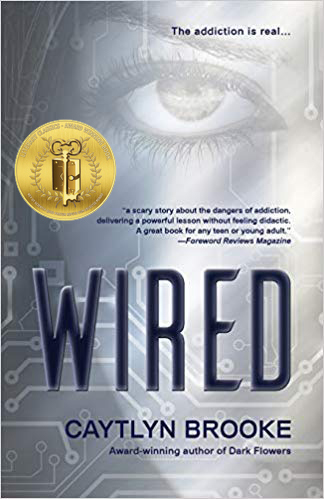 Wired is a powerful story that resonates with brutal honesty of tech addictions experienced by so many people today; this book has a powerful message that speaks volumes to YA audiences. Recommended for home and school libraries, Wired has earned the Literary Classics Seal of Approval.